Welcome To Hingewerks Commercial Doors Inc.
Hingewerks guarantees competitive pricing with complete and responsible proposals, delivered in a timely fashion. Contact us today to receive a free quote on your next door project. The philosophy of Hingewerks is to employ the most qualified technicians in the industry. Our technicians are trained to service any door issues that may arise in your facility and will handle them with pride and professionalism. Hingewerks understands the importance of getting your doors repaired on the first call. Hingewerks takes an immense amount of pride in the delivery of turn-key, on-time projects. In the current commercial construction environment, it has never been more crucial to deliver product satisfaction and adhere to project schedules. Our goal is to partner with our customer base and provide these key benchmark components. Working closely with Architects and Designers is a front line goal of Hingewerks. A project most certainly goes smoother when installed by a door contractor that is fully aware of Design Intent, from inception to completion. Sensors and cutting edge door technology. 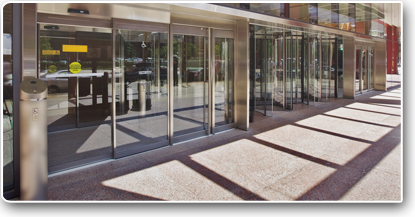 Automated Door Solutions by La Force, A.D.S., has a lengthy history in the door, frame, hardware and pedestrian automatic door industry. Copyright 2011 Hingewerks Commercial Doors, Inc. All Rights Reserved.